Nobody can keep me far away from a curry, whether it’s a Tikka Masala or a Madras, me, Seb and Luke (my housemates) will feast away on them! If you find yourself in London and feeling a bit peckish, you should definitely check out Sagar in Hammersmith. Sagar is a South Indian vegetarian restaurant, serving unbelievably tasty food and mouth watering sweet lassi’s. The thing that makes Sagar always stand out to me is their thali’s, which consists of about 6 small portions of curries, so you can try each one. I was always a massive buffet fan, so having the options of a buffet but at the quality of a professional restaurant, Sagar really is unbeatable. If you do dig into a thali as a pair, the best option is to get a traditional Udupi Thali and get an additional Garlic rice. I would also add the vegetable Kurma, however this really does depend on how big you want your belly to get (my family are big eaters). If you’re working in Hammersmith, or close by, you can actually order it for lunch and they offer a great price on their takeaway option, meaning you can grab it and take it back to the office with you. Warning: great smells in the workplace will result in evil looks and spoons being thrown at you. One really noticable thing about the restaurant is they will remember your face, as it is the same staff that have been there for about a decade, meaning you feel a bond to Sagar after a while. 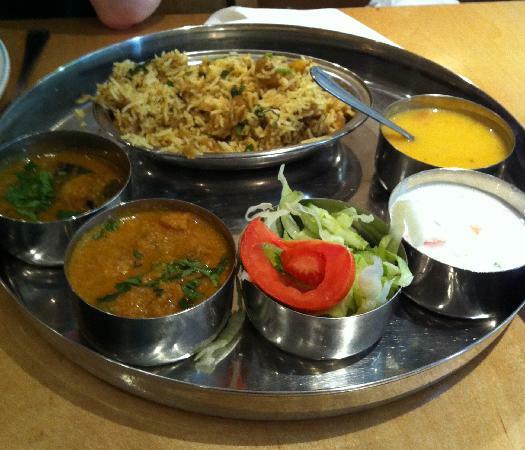 If you happen to be in the centre of London, you can also grab yourself a thali at the Sagar in Covent Garden. Let me know your favourite places to eat while in London, I’m always happy to tick off a few more places! Next stop will have to be a fondue restaurant!